Never Mind The Mainstream on KUR (College Rock Radio): The show is almost as old as we are! Number 19! The show is almost as old as we are! Number 19! Friday is a mighty day. It's the jump start kicker to your weekend, and you should behave as such: relax, drink, be merry, and LISTEN TO THE BEST OF YESTERDAY'S, TODAY'S, (AND TOMORROW'S) ALTERNATIVE AND INDIE ROCK 'N' ROLL! And that includes Punk Rock, Post-Punk, New Wave, Goth Rock, Shoegaze, Grunge, Britpop, Twee Pop, Electroclash and oh so many more sub genres; and you can hear the greatest artists of these styles on Never Mind the Mainstream! 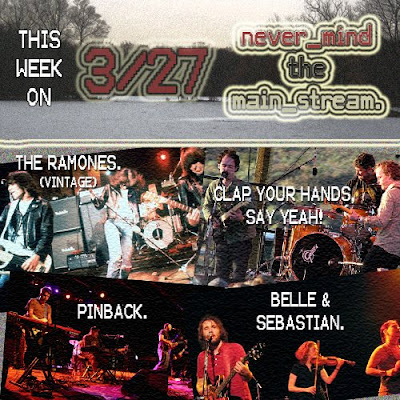 We thrive off the underground sounds of bands like Pinback, Clap Your Hands, Say Yeah!, and Belle & Sebastian, and we'll showcase their music this week on the program. Also, we have a great line-up of classic tunes, starting with the Queens first family of punk rock - The Ramones! This show will also feature background music from the pioneers of hip-hop. That's right - old school rap, people. Listen in tomorrow, FRIDAY, 6-8 PM, on KUR! (kur.kutztown.edu - that's our webstream!). And like we always say, feel free to call in at (610)-683-4058 or IM us at KURRequest. We'll be taking callers all show long. See you then!